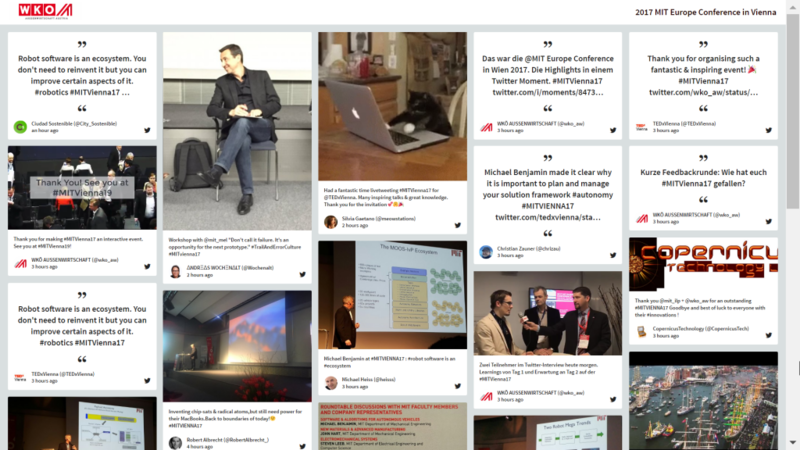 Fresh van Root was hired to cover the MIT Europe Conference 2017 live from the event. This is a good opportunity to share how we approach such projects. The MIT Europe Conference happens every two years in Vienna. It was hosted by the Aussenwirtschaft section of the economic chamber of commerce. Luca and I were on location and covered the event on social media, primarily on Twitter, but monitoring other channels as well. 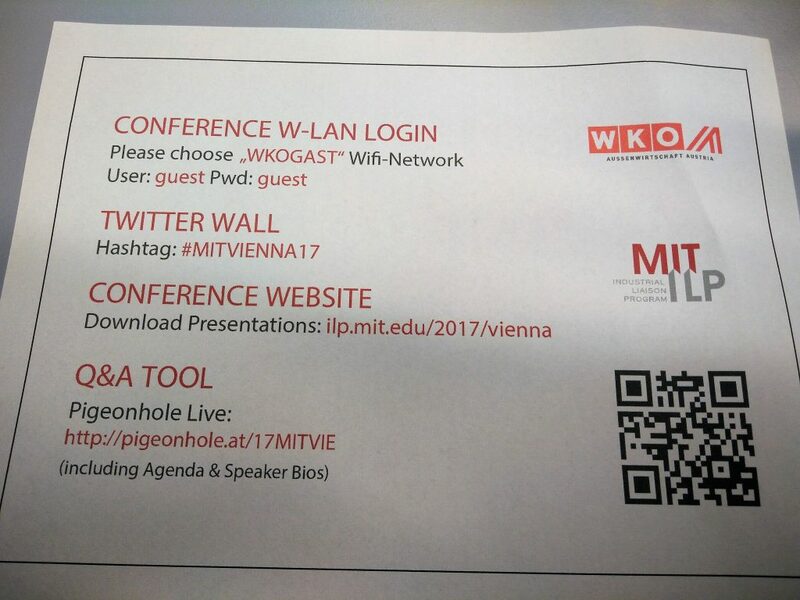 Posts using the hashtag #MITVienna17 from Twitter, Instagram and Facebook were featured on big screens inside the conference room. Let’s talk about the things you should prepare in advance first. Do research on speakers and topics a few days ahead of the conference. Check which speakers are on social media and create a (private) list of people you would like to mention or involve in discussions during the event. If possible, you should do the same with the attendees list. Remember that you cater to two audiences (in most cases). Put all the material you will need to create your posts in a single folder. Logos, images, animations, brand guides etc.. When the room is packed and you need to both follow the talk and collect or create content you need to be quick. Nobody is picking up a citation of a speaker on social media 1 hour after it was said live. On average you should need less than five minutes from something being said to you posting it online. The better you are prepared, the easier this gets. Tools you already know and like are preferred. Don’t change your toolset shortly before an event. For creating shareable images with citations, you could use Adobe Spark or Pablo. Both tools are limited and therefore easier to use. Don’t change the designs too much for each shareable. Ideally they all have the same logo/tagline and a similar feel. For example darkend, same font and color, aligned right. For GIFs you could use GIFme, or similar ones. There are hundreds of tools, stick to a toolset as a team so that the produced material looks the same throughout the conference. The audience can tell who posted it an image by looking at it, which is important for branding. Who is collecting content from the audience, featuring speaker content and sharing it? Who is managing your social media wall and Q&A panel. These things should be discussed and planned thoroughly to reduce stress while the event is happening and avoid misunderstandings. It helps to go over the schedule with the whole team before the event starts and talk briefly about the things you planned. This helps to synchronize the expectations and reminds everyone of their responsibility. Create a WhatsApp group, Slack channel or any other communication app to quickly share content and discuss at the event. Have one central cloud drive folder where all material can be uploaded to for further editing. Avoid running around with USB sticks or SD cards. At bigger conferences you will have two groups: One for the social media core team, and one for the extended team where other event stuff can post shareable material to. 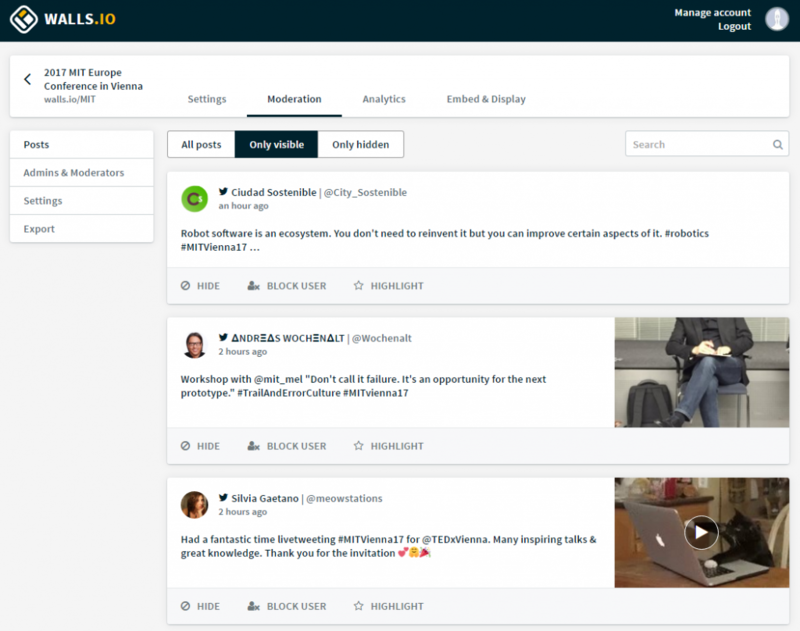 Use your network locally to discover content you may miss – you can’t be present at every talk and spot all the time. Bonus: Have a chat open with the person in charge for the event to not have to guess or ask around for crucial information. If the schedule changes or things of that importance happen you need to quickly verify that information. People should not have to search to understand what the hashtag is about. At the same time it should be short enough to leave enough characters for the rest of the content and make it faster to type. Proper sharing of Hashtags and WiFi details is crucial. Communicate this information on multiple channels, on handouts, slides, monitors at the venue, also ask moderators and speakers to mention it throughout the day. This is important to get the discussion started. At the event, try to connect with people by answering questions, reaching out to them, interacting with their content about the event and connecting them with each other. When topics emerge, try to connect people for physical meet ups (connect experts to audiences). At MIT Europe Pigeonhole was used for managing questions from the audience. Attendees can post and upvote questions. Both the social media wall and Q&A overview was shown on 4 big screens in the main room. 10 minutes before each talk ended, we shared the link to the current form. There are many options available to feature posts from social media at your event. We love walls.io (and might be biased), but you should check it out (only a few weeks ago the launched a free option). Giving the audience a chance to have their name up on a big screen with their posts makes it more interesting for them to post content, because there you reach people who are not on Twitter all the time. Especially when your hashtag gets picked up and is discussed by a large audience automated twitter accounts (spambots) will try to abuse your hashtag. Keep them out of your social media wall at the event (block single posts first, if it continues block the user from your wall). Remove posts that attack the event or the speaker. You can still engage with them via replies, but they should not be allowed to set a negative tone for everyone. Have everything with you, even things you do not plan to use. 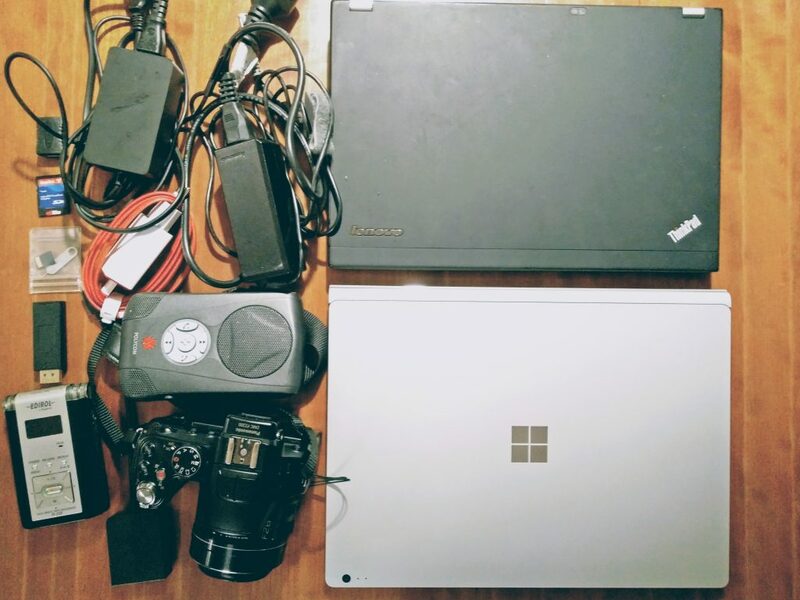 Adapters, battery packs, a second tablet or laptop, video equipment. Remember the last time you were thinking “oh if I would have *this* with me now I could …”. At conferences it can get noisy, crowded, uncomfortable, hard to concentrate and work on content. Set up a base in a separate meeting room where you can follow the conference, sync up and have your gear set up. Live coverage on twitter is noisy. You will probably send much more tweets than you regularly do. Give your followers a heads up by saying that you attend the event and that you will cover it live. Only share little or no content that does not relate to the event, to create a consistent experience. By planning out everything carefully you might forget that adding social media communication to your event is also about allowing your audience to have fun, and you should too. You can share funny moments from the talk (“Finally some cat content on the slides!”) as well as add some humorous thoughts (“The room is packed. Glad we have enough space in the control room”). Check Out the Social Media Wall and Twitter Moment featuring the event. Get new posts via eMail: We write about social media, content marketing, blogging, WordPress, tools & apps for marketers, collaboration and productivity.